George Paulet, 12th Marquess of Winchester was the son of Norton Paulet and Jane Morley. He married Martha Ingoldsby, daughter of Thomas Ingoldsby and Anne Limbrey, on 7 January 1762.1 He died on 22 April 1800. He gained the title of 12th Marquess of Winchester. [S6] G.E. Cokayne; with Vicary Gibbs, H.A. Doubleday, Geoffrey H. White, Duncan Warrand and Lord Howard de Walden, editors, The Complete Peerage of England, Scotland, Ireland, Great Britain and the United Kingdom, Extant, Extinct or Dormant, new ed., 13 volumes in 14 (1910-1959; reprint in 6 volumes, Gloucester, U.K.: Alan Sutton Publishing, 2000), volume III, page 236. Hereinafter cited as The Complete Peerage. 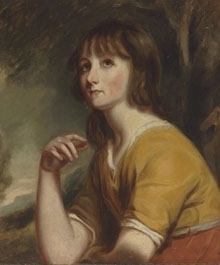 Martha Ingoldsby was the daughter of Thomas Ingoldsby and Anne Limbrey.1 She married George Paulet, 12th Marquess of Winchester, son of Norton Paulet and Jane Morley, on 7 January 1762.2 She died on 14 March 1796. From 7 January 1762, her married name became Paulet. Charles Ingoldsby Paulet, 13th Marquess of Winchester was born on 30 January 1765. He was the son of George Paulet, 12th Marquess of Winchester and Martha Ingoldsby. He married Anne Andrews, daughter of John Andrews, on 21 July 1800. He died on 29 November 1843 at age 78. He gained the title of 13th Marquess of Winchester. Anne Andrews was the daughter of John Andrews. She married Charles Ingoldsby Paulet, 13th Marquess of Winchester, son of George Paulet, 12th Marquess of Winchester and Martha Ingoldsby, on 21 July 1800. She died on 21 March 1841. John Andrews lived at Shotney Hall, Northumberland, EnglandG. [S21] L. G. Pine, The New Extinct Peerage 1884-1971: Containing Extinct, Abeyant, Dormant and Suspended Peerages With Genealogies and Arms (London, U.K.: Heraldry Today, 1972), page 237. Hereinafter cited as The New Extinct Peerage. Augustus John Henry Beaumont Paulet, 15th Marquess of Winchester was born on 6 February 1858. He was the son of John Paulet, 14th Marquess of Winchester and Hon. Mary Montagu. He died on 11 December 1899 at age 41 at Maggersfontein, South AfricaG, killed in action. He gained the title of 15th Marquess of Winchester. He fought in the Boer War. Henry William Montagu Paulet, 16th Marquess of Winchester was born on 30 October 1862. He was the son of John Paulet, 14th Marquess of Winchester and Hon. Mary Montagu. He died on 28 June 1962 at age 99. He gained the title of 16th Marquess of Winchester. Her married name became Vane. After her marriage, Lady Catherine Margaret Powlett was styled as Countess of Darlington on 8 September 1792. [S6] G.E. Cokayne; with Vicary Gibbs, H.A. Doubleday, Geoffrey H. White, Duncan Warrand and Lord Howard de Walden, editors, The Complete Peerage of England, Scotland, Ireland, Great Britain and the United Kingdom, Extant, Extinct or Dormant, new ed., 13 volumes in 14 (1910-1959; reprint in 6 volumes, Gloucester, U.K.: Alan Sutton Publishing, 2000), volume I, page 119. Hereinafter cited as The Complete Peerage. [S6] Cokayne, and others, The Complete Peerage, volume III, page 285. [S6] Cokayne, and others, The Complete Peerage, volume III, page 286.